Overview - After ten years of marriage, Jeff and Nealy Lang (Tobey Maguire and Elizabeth Banks) have an idyllic suburban home... and a relationship on the skids. But, when a family of hungry raccoons ransacks their perfectly manicured backyard, Jeff becomes obsessed with eradicating the pests by any means necessary. Soon the relentless rodents aren't merely uprooting the lawn, but also overturning the Langs' entire bourgeois existence, as the man-versus-beast battle leads into an absurd mess of infidelity, extortion, organ donation and other assorted mayhem. How does that old saying go? "God is in the details." Or is it, "the Devil is in the details?" Oddly enough, both are fitting when discussing Jacob Aaron Estes' dark dramedy appropriately titled, 'The Details.' A quirky, twisted story about man's dueling angels and demons, the film reveals the surprisingly intermingled consequences of kindness and deceit. With a strong cast, interesting themes, and a somewhat thought provoking conclusion, the movie mostly overcomes some tonal problems to result in an effective little morality tale -- one that somehow gets by without having an actual moral. After entering a rut in his marriage, Jeff (Toby Maguire) starts to take out his frustrations on a pack of raccoons who are decimating his newly landscaped backyard. After a series of unfortunate coincidences and poor decisions, the mild-mannered suburban father soon finds himself entangled in a web of infidelity, cat poisoning, bribery, kidney donation, and… murder? With his world crashing all around him, Jeff is forced to ride out a bizarre karmic rollercoaster. Racked with guilt, he'll have to decide what kind of man he really wants to be, or risk any hope of finally getting rid of those pesky raccoons! As played by universal everyman Tobey Maguire, Jeff immediately seems like your average, good-natured guy. Sure, he's got some marital problems, but he appears to be trying to work through them. As the runtime goes on, however, and the character finds himself in one increasingly terrible predicament after another, we're suddenly left asking ourselves if this apparent "Mr. Nice Guy" was ever really all that nice to begin with. It's an interesting development, one that not only sneaks up on the viewers, but also the actual character. Oscillating between incredibly poor choices and grander, selfless acts, Jeff attempts to overcompensate for his repeated mistakes, seemingly trying to convince himself that he's not a total jerk. As one man he's wronged tears him down to nothingness, another man he's helped builds him up to sainthood, creating an interesting, contradictory dichotomy that fuels most the film's deeper themes. Maguire does a great job of carrying us through the emotional seesaw, and always maintains an engaging presence, even when his character does make some despicable decisions. A darkly comedic tone pervades the proceedings, and while this twisted sense of humor ultimately works, there are some rough patches early on. The film's initial scenes try a little too hard to be quirky, and though these bits help to establish the script's odd temperament, a lot of the idiosyncrasies lack substantial wit or substance, leading to empty strangeness that falls flat or clashes against the screenplay's otherwise dramatic elements. This is particularly true of the kooky neighbor character played by Laura Linney, who starts off feeling way too over-the-top. Thankfully, the more the film's events start to spiral out of control and build upon one another, the more the tone starts to click into place, and before long even Linney's character feels right at home among all the crazy shenanigans. In fact, she ends up being rather amusing. Likewise, the rest of the supporting cast, which includes Elizabeth Banks, Kerry Washington, Dennis Haysbert, and Ray Liotta, are all good in their roles, especially Liotta who makes a very strong impression in his limited screen time. Director Jacob Aaron Estes does a solid job of keeping the potentially troublesome mood in check, and while notable inconsistencies remain, the film gradually finds a steady voice. Cinematic flourishes like bookending voiceover narrations, uncomfortable close-ups, fast forwarding flashback sequences, and fleeting surreal embellishments, add some stylistic variety, reinforcing the distorted, unusual tone with complementary aesthetic quirks. The film's score is also particularly memorable, and the dramatic main theme, complete with a backup choir, perfectly escalates in tandem with the rising tension and farcical insanity of the plot -- leading to an interesting climax that takes some unexpected turns. At its best, the film's warped excursion into deadly suburban dysfunction starts to evoke the black absurdity of the Coen Brothers. While the movie never comes close to reaching the same heights as that celebrated duo's superior films, it's still a surprisingly interesting effort that grows increasingly engaging as the runtime continues. It took me quite a while to warm up to the movie, but once the various pieces started to fall into place, and the film reached its operatic, morally ambiguous climax, I finally started to appreciate both the broader strokes and smaller nuances of Estes' work. None of the characters end up being particularly likeable, and there really might not be a clear message or specific purpose beneath all the odd, twisted turns and absurd connections, but somewhere packed within all the strange details, is a worthwhile peek into human (mis)behavior and karmic satire. Anchor Bay brings 'The Details' to Blu-ray on a BD-25 disc housed in a keepcase. Some skippable trailers play upon start up before transitioning to a standard menu. The release is region A coded. The movie is provided with a 1080p/AVC MPEG-4 transfer in the 1.78:1 aspect ratio. Though far from a standout release, the transfer gets the job done with only a few minor hiccups here and there. The print is in perfect shape with no signs of damage. While a light layer of grain is visible, there are instances where the grain can look somewhat noisy in darker scenes. Clarity is good throughout, but the picture is never particularly sharp, and dimensionality isn't as strong as other contemporary releases. The color palette favors a fairly cool cast, and a few sequences feature a greenish hue. Saturation looks a bit subdued in some shots, but there is some periodic pop rendering all the suburban locations with a deceptively cheery sheen. Contrast is mostly well balanced but the video is a bit dim in some indoor scenes, and shadow delineation is on the murky side in nighttime sequences. When it comes to picture quality, 'The Details' isn't exactly brimming with detail, but the transfer suits the content well enough, and the issues that do crop up are relatively minor and, for the most part, seemingly inherent to the original photography. The film is presented with an English DTS-HD Master Audio 5.1 track, along with optional English SDH and Spanish subtitles. Lacking in scope, the soundstage is small but appropriate, bolstering the story in isolated bits, particularly when it comes to the score. Speech is clear and there are thankfully no major technical issues to speak of. Some scattered ambiance (birds chirping, traffic, etc.) hits the surround, lending the suburban setting a decent but not particularly enveloping sense of atmosphere. Notable directionality is sparse and the overall sound design is relatively basic, placing the emphasis on dialogue and music. The score itself is very effective, and the recurring main theme suits the material wonderfully, perfectly complementing the dark, quirky tone with powerful swells of music that feature immersive separation and wide dynamic range. Bass activity perks up in some of these score selections, but otherwise low frequencies are negligible. A bit more auditory texture could have helped enhanced the experience, but the mix remains effective, and the music really does help to reinforce the darkly absurd drama. Alternate Beginning (SD, 2 min) - An alternate opening is included with Dolby Digital 2.0 audio and optional English subtitles. Though similar to the opening used, this version adds a fantastical twist that was sensibly omitted. Alternate Ending (SD, 5 min) - Far inferior to the ending used, this alternate conclusion follows through with the twist introduced in the alternate opening. Though superficially darker than the final ending, the tone is much too silly and "cutesy" to have any real impact. The filmmakers were wise to use the more realistic and morally ambiguous finale featured in the final cut. 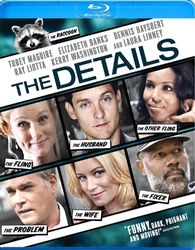 'The Details' is an odd little black dramedy. The tone is uneven and the attempts at twisted, quirky humor occasionally fall flat, but the cast is strong and the film ultimately examines some intriguing thematic material. The video transfer and audio mix are both modest but offer a solid experience. While there aren't many special features, the included alternate ending and beginning are interesting. This is isn't a wholly successful effort, but there's enough here to warrant a look for fans of similar, darkly humorous tales about spiraling drama.